Arunachal CM appreciated the Army for facilitating recruitment rallies in different locations in the state which has given local youths ample chance to get recruited in the great Indian Army. Major General R K Jha, GOC 5 Mountain Division, Tenga called on Chief Minister Pema Khandu at DK Memorial Museum, Famla on Friday. Basically a courtesy call on, the meeting surrounded talks on myriad subjects ranging from land acquisition, compensations matters, recruitment rallies and Rajya Sainik Board. Briefing the CM about the status of compensation issues of other Army occupied areas, General Jha said that the matter is being expedited and the locals will soon be handed over with the compensation money. General Jha impressed upon the CM to take up establishment of Rajya Sainik Board at the earliest in order to infuse a sense of belongingness and encouragement to personnels of arm forces. While assuring that the matter will be expedited, Khandu said that the subject of Rajya Sainik Board which was under the Disaster Management Department earlier is now taken up under the Home department. On the invitation of GOC, CM Khandu assured to visit Tenga and interact with the Army jawans there. 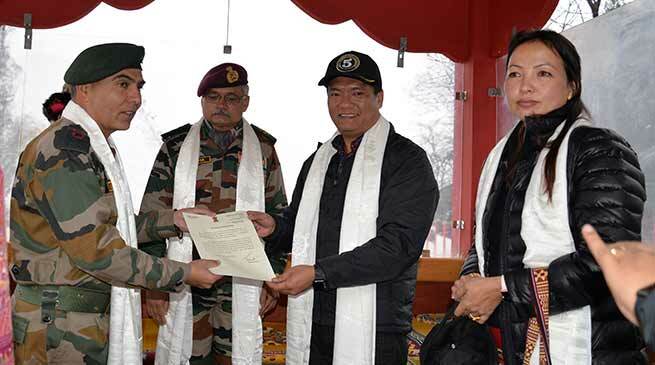 “I would love to be amidst our brave jawans and share views” Khandu said. CM appreciated the Army for facilitating recruitment rallies in different locations in the state which has given local youths ample chance to get recruited in the great Indian Army. Meanwhile, the Chief Minister in the presence of GOC handed over a letter of appreciation to Lt Col. Manu Virmani of Hq. 190 Mtn Brigade of Tawang for his concerted effort in establishing excellent Civil-Army relation and by winning over the heart and mind of the people of Tawang by associating the Army in all the mega events in Tawang. Lt Col Virmani was felicitated with a white scarf and a book with the appreciation letter. Earlier, CM, GOC along with the local MLA Tsering Tashi took a round of the DK Memorial Museum. Among others officiating Commander 190 Mtn Brigade was also present.